Our recent class discussions about Product Life Cycles made me think about the rise and fall of the New York Institute of Technology (NYIT) – Bahrain. After being one of the best universities on the island, the Management decided to phase-off their program from Bahrain, leaving behind thousands of Alumni, a team of staff members and two large campuses. “If I can make it there.. I can make it anywhere!” was the thought of NYIT’s Middle East Chairman, Dr. M. Husain, after he succeeded in entering the United Arab Emirates education market with the first NYIT campus in the Middle East. His next mission was Bahrain; he believed that a campus in Bahrain could attract potential students living in Saudi’s eastern provinces and other GCC countries as well. Like other organizations, Universities have a life cycle. They introduce their products as degrees to the market. In October 2003, NYIT-Bahrain opened its doors for new applicants in a medium size villa in Juffair with a small team of academics and staff members. It was the first American university in Bahrain, offering limited Majors in Business and Information Technology. Students liked the idea of studying locally and earning an international degree and many were looking forward to attend the annual graduation trip to New York once they complete their programs. A year later, NYIT had to triple its intake capacity to fulfill the increasing demand. A new campus was built, more sections and classes were offered and the many part-time professors converted to full-timers. Several universities were established in the same year, but NYIT managed to stand out and to gain a large share of Bahrain’s higher education market by introducing new degrees in Interior design and Computer graphics as well as having a very creative and active student life. The university was running at an ideal capacity, where the number of the graduated students was equal to newly accepted freshmen. NYIT was doing great until 2009, when the Higher Education Council of Bahrain decided to come up with a new set of regulations, aiming to standardize all private universities in Bahrain. This would be done by standardizing courses, degrees and majors names and interfering with the Management and the Board’s regulations. NYIT could not adapt to the changes like the other local competitors, as all NYIT campuses around the world must follow the same American standard programs, otherwise they would be threatened to lose their International License and Accreditation. Many attempts were made with the ministry to prevent further downturn, but all were unsuccessful. Unfortunately in May 2010 NYITs’ Advisory Board officially declared the phase-off plan of the Bahrain branch, and started cost-cutting and shutting-down departments in order to reduce capacity. 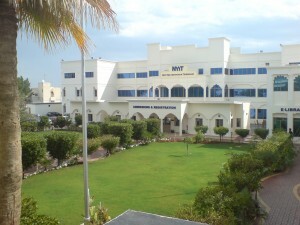 NYIT-Bahrain will continue to run until all students graduate by 2013. Do you think that NYIT made the right decision by closing the Bahrain Campus? Were there any alternative solutions that they could’ve taken to extend their life cycle in Bahrain? ← My friends..do you remember Nokia ? Very Informative article great job! I believe though each foreign entity that will operate in any country should take into consideration such risks by using the PEST analysis, by making Qualitative and Quantitive forecasts. Moreover if you recall the ministry of education raised the red flag way before implementing such regulations. I think the university had to make changes back then. Yes there is the product life cycle but the company could extend its product life cycle by adapting to any change. However I would agree with the part you mentioned about the university that it might risk its licensing if any change occurred and that was a tough decision to take. Thank you Ahmed for this valuable article that opens our eyes as students in choosing our universities. In my opinion, universes shall be aware to the local rules and regulations before any further expansion. Meeting the international guidelines would the best mean whenever you enter a country. Moreover, meeting the international standards, ethics and quality will definitely never let you business down in any part of the world. Thank you so much for your post Ahmed. Whenever we hear the term product we often think of in physical terms and we tend to overlook services. It is really such a shame that such a reputable university is phasing out from Bahrain. Some would argue that what happened to NYIT is because they could not keep up with the new requirements of the field. I agree with Mohammed that the ministry raised their concerns a while back and were clear about the consequences. Some would say that the proposed timeframe to implement all the changes was not realistic. My answer to that will be that other universities in Bahrain have adapted to the change and managed to implement the new requirements. About what Sayed Ali said, I would say that having an international standard would reduce your risks big time but is it a guarantee for business continuity? Thanks Mahmood, I believe international standards makes it more challenging for global businesses to function in different countries. NYIT case was an example of a global company with unified standards that couldn’t adapt to changes with regulations abroad. Great Article ! As i know that NYIT was one of the first private universities to enter Bahrain in 2003, as the country had no private universities so high school graduates had only two choices: either to study in the University of Bahrain or travel abroad. The establishment of NYIT was a good idea and it was very successful due to the huge demand for its program. I think the Higher Education Council made a mistake by interfering in the regulations and majors offered in Bahrain. Bahrain was trying to create an education toursim sector that will attract foreigners from neighboring GCC countries to come and study in Bahrain and at the same benefit the economy due to the increase in consumer spending such as malls, restaurants and cafes, car rental companies and hotels and apartments. Therefore, Bahrain should create the right environment that attracts foreign universities to enter Bahran because this will benefit the country as a whole. A good example will be Dubai. Dubai created a knowledge village and attracted worldwide universities such as the Australlian University of Wollongong and the Scottish Heriot-Watt University and the British Middlesex University and the Indian Mahatma Gandhi University and the Russian Saint Petersburg State University and the Canadian University of New Brunswick. Those universities attracted many foreigners not only from Arabian Gulf Countries but also from other Arab and Western countries who are willing to live and work and study in Dubai. I found your post to be very interesting for the business which is talking about product life cycle. I believe that, before starting any kind of business should know the regulations and standard of the county to consider any obstacles/risk might occur. To make your business successful in each aspect you need to do forecast with Qualitative method and Quantitative method to forecast the demand and base the price on the forecasting to be with market. My answer to your question is yes NYIT made the right decision by closing the Bahrain Campus to not lose their international License and Accreditation. The solutions were once higher education council of Bahrain decided a new set of regulations and standardization they could have a time to adapt themselves to extend their life cycle in Bahrain. First of all, thank you Ahmed for this post. As a former NYIT Bahrain student, I am very saddened to see my former university fall so far from grace, so to speak. I had a wonderful experience as a bachelor student, and I believe during the time I was there the university was in its maturity stage. Looking back, when I entered the university car park, there literally wasn’t a single empty space; the university was vibrant, wealthy in knowledge and student facilities. However, like you said, with the growing demand of the Higher Education Council of Bahrain and I my opinion, the university’s lack of innovation (such as adding new majors to the curriculum) it is no wonder that they reached their decline phase. In answer to your question, I think NYIT shouldn’t have given up; they should have added new majors, improved their facilities and invested more in advertising. Maybe after taking this course of action they would have been able to get back up on their feet, and if that didn’t work too, THEN they should consider shutting down. Thank you Layal. I totally agree NYIT was a wonderful experience, both education and student-life were great! Unfortunately, in 2009, the Ministry didn’t allow NYIT to advertise or announce registrations in newspapers and magazine until receiving the Higher Education Council approval. The full procedure shouldn’t take more than 20 minutes, but we used to wait for at least 3 months before receiving a single approval. By the time we receive it, the ad information is already out of date, registration closed and the semester begun. This was another issue that NYIT had to deal with in Bahrain. Interesting article in multiple ways. First, as some of your classmates have already alluded to, you don’t usually consider services following the same product life cycles as tangible products often do. It would be interesting to have a comparison of what the average/mean product life cycle of a service would be compared to tangible products. I would expect that the service life cycle would be longer especially in an educational setting. I also thought this article was interesting because of how it should be applied across industries. “mohammedala502” said it well in that every global company should consider the risks associated with foriegn investments. There are many risks that should be considered, but it sounds like NYIT didn’t address the political risks and how it could impact its curriculum. Unfortunately, I believe many global companies learn these lessons the hard way. Companies seeking growing profits through capitalizing on high growth economies often times throw themselves into new markets without analyzing the risks. I’d be interested in hearing other stories of companies that have tried to enter the Bahrain market and what made them successful or unsuccessful. The regulations really hurt them than becuase many university in America have their own standards that each would have to a bid by. With new regulations of the country the standards and curriculum transfer from one school to the next did not keep up with the stadards of America. My best bet they were trying to change to their way instead of a global way. The other school should have been trying to follow in the university ways and not making the university change to their way which as result you can see.